Scudder named this skipper for Egeremet, a chief or sachem who participated in the war waged by Indians in Maine against the English between 1688 and 1697. Egeremet, assisted by the French, attacked a garrison in Wells, Maine in 1692 (Zirlin, 2005-6). Scudder was the first to name egeremet, and to formally describe it from a type specimen taken in Massachusetts (#15827 in the MCZ). But he and other early lepidopterists did not clearly distinguish this species from otho, the Southern Broken-Dash, whose description and naming trace back to English naturalist J. E. Smith in 1797, working from a drawing supplied by James Abbot in Georgia. The two species were definitively separated only in the 1970s, through the work of J. M. Burns (1985). But since Southern Broken-Dash is a southeastern coastal plain species, not found north of Maryland in the east, Scudder’s comments about the butterfly in the northeast apply to egeremet only. In Scudder’s experience, egeremet was largely confined to the southern half of New England. “...it is found nowhere in abundance north of Springfield, Mass. (Emery), where it is a common species” (1889:1699). Scudder lists no other locations or specimens, but F. H. Sprague, a major collector of the day, was able to find it in all his usual collecting places around Boston: Wollaston (1883, 1885, 1896), Roxbury (1883), Jamaica Plain (1883), Malden (1883, 1895) and Milton (1885), as well as throughout the Connecticut River valley: Belchertown (1878), Granby (1885), Amherst (1886), Deerfield (1885) and Montague (1885) (specimens in MCZ; see also Burns 1985 for a list, and Sprague 1879). Newton naturalist Maynard (1886) had seen two specimens “loaned me by Mr. F. H. Sprague, taken in June and July, at Wollaston, Mass.,” and described the skipper as "rare." But Northern Broken-Dash cannot have been truly rare, given the impressive number and breadth of Sprague specimens. He had more specimens of Northern Broken-Dash than he did of Pepper-and-Salt and Cobweb Skippers, and about the same number as of Crossline Skipper. 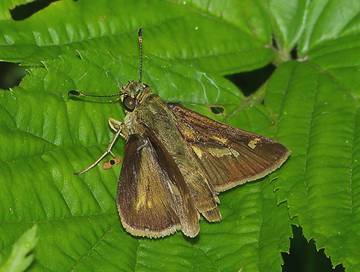 Northern Broken-Dash, like Little Glassywing and Delaware Skipper, may well have entered Massachusetts first through the Connecticut River valley. In 1900 these latter two skippers were uncommon or rare, and found only or mainly in “the valley,” according to Scudder, while Northern Broken-Dash seems to have been a bit more widespread. But in comparison to Indian, Leonard’s, Long Dash, Tawny- edged, Least and Peck’s Skippers, all of which had already become common statewide as a result of clearing for agricultural development (Table 1), Northern Broken-Dash seems to have been less easy to find in 1900, while Little Glassywing and Delaware were only just arriving in the state from further south (Stichter 2013b). By the 1930’s, Northern Broken-Dash seems to have become much more common, at least in eastern Massachusetts. In his review of the lepidoptera of the region, Farquhar (1934) is able to list many more specimens and locations than Scudder had, particularly in eastern Massachusetts: Andover (F. G. Sanborn, 1868, specimen at BU), Gloucester (Forbes), Marblehead (Walker), Salem ( F. H. Walker), Stoneham (C. V. Blackburn), Westwood (D. W. Farquhar), and Woods Hole (Forbes,1919, specimen at BU) in the east, as well as Chester (C. W. Johnson, 1914, specimens at BU and MCZ), Monterey (Sprague), and Phillipston (H. H. Shepard) in western Massachusetts. (Boston University and Harvard MCZ have several but not all of these specimens.) The MCZ has a 1914 specimen from Tyngsboro, a 1918 specimen from Weston, and a 1945 Nabokov specimen from Wellesley. Jones and Kimball (1943) report Northern Broken-Dash as "widely distributed, not rare" on Martha's Vineyard, but absent from Nantucket. There are no specimens in the Kimball Collection at the Nantucket Maria Mitchell museum. By the 1960’s Northern Broken-Dash was apparently so common that most collectors did not bother with it. William D. Winter collected it in 1966 in Westwood, 1974 in Sherborn, and 1983 in Dedham (specimens in Harvard MCZ). E. Peters reports it in July and August 1970 and 1971 in Carlisle (Lep. Soc. Seas. Sum. 1970, 1971). C. T. Parsons collected in on Naushon in the Elizabeth Islands in 1971 (MCZ). Overall, Northern Broken-Dash appears to have increased in Massachusetts since 1900 (Table 2). Northern Broken-Dash’s range today is large. It extends further into Canada than does Little Glassywing (Layberry 1998). In the United States it is found from southern Maine (http://mbs.umf.maine.edu/Butterfly%20Species%20List%209.htm ), west through Ontario to Minnesota, south through the plains to Texas and east to mid-Florida. Its range overlaps with and largely encompasses that of both Little Glassywing and the Southern Broken-Dash, Wallengrenia otho. The latter is found mainly on the southeastern coastal plain, in Texas, and in the West Indies and south (Opler and Krizek 1984; Cech 2005). The 1990-95 Connecticut Atlas found Northern Broken-Dash ovipositing in the wild on Dichanthelium [=Panicum] clandestinum, or deer-tongue grass, and Panicum dichotomiflorum or fall panic-grass. Shapiro (1974) reports P. dichtomum forked panic-grass for New York state. These three panic grasses are native and widespread throughout Massachusetts (Sorrie and Somers 1999). It is not clear whether Northern-Broken Dash uses the widely planted switchgrass (Panicum virgatum) in Massachusetts; this grass is strictly native only in the central part of the state, but has been introduced in eastern Massachusetts and the Berkshires. Schweitzer (NatureServe 2010) indicates Panicum virgatum as the main host in southern New Jersey, but Scott (1986) does not list it as a natural host, although the butterfly can be raised on it in the lab. As Leahy in the Massachusetts Atlas points out, Northern Broken-Dash’s host grasses occur in both wet and upland habitats. D. clandestinum tends to occur in moist, sandy sites, including woods openings, edges, and waste places, while P. dichotomum prefers dry, sandy or rocky woods and borders (Magee and Ahles 1999). Northern Broken-Dash adults are found nectaring on many different flowers in a large variety of settings, including rural meadows, field edges, woodland grassy openings, roadsides, airports, gardens, and even urban parks if they are not too frequently mowed (NatureServe 2010). This species appears tolerant of disturbed situations. Cech (2005) terms Northern Broken-Dash a habitat generalist. MBC sight records 2000-2007 rank Northern Broken-Dash as “Uncommon to Common” today. Uncommon 100 years ago, it is now one of our four most common native grass skippers, the others being Peck’s Skipper, Least Skipper, and Dun Skipper (Table 5). (European Skipper is introduced.) The 1986-90 Atlas called it “locally common” throughout the state, but perhaps more common in the east. It is interesting that a species so familiar today was so little known by Scudder, and not at all by Harris. It seems to have been pushing its range northward, and/or becoming more common by increasing its tolerance for disturbed situations. A moderate upward trend is seen in MBC sightings per total trip reports 1992-2009 (Chart 96). Northern Broken-Dash is one of several grass skippers to show an increase in sightings over this period; others are Least Skipper, Tawny-edged Skipper, Little Glassywing, and Dusted Skipper. An analysis of 1992-2010 MBC data using list-length as a measure of search effort found no change over this period in probability of detection of Northern Broken-Dash (Breed et al. 2012). The high reading for 1999 in Chart 95 results from unusually large counts in the central and western part of the state. A high of 220 was reported on the Northern Worcester County NABA Count in 1999; this compares to 40 or less in all other years for that count (1996-2010), and after adjustment for effort (party-hours), is three times the number found in any other year on that count. On the Central Franklin count, 92 were also reported in 1999; after adjustment for effort this was more than twice the number found on any other year of that count (1992-2010). Similarly, on the Central Berkshire count 90 were reported in 1999, which after adjustment for effort is three times the number found in any other year (1992-2010) on that count except for 2008, which was also a good year around Pittsfield. Therefore it seems that 1999 was an exceptionally good year for Northern Broken-Dash, at least in the northern parts of the state. Northern Broken-Dash has been found in 161 of the 351 towns in Massachusetts 1992- 2013, and is well distributed across the state, except that there are no BOM-MBC or Atlas records for Nantucket. Northern Broken-Dash is regularly reported on all of the Massachusetts NABA July Counts, which take place at peak flight time for this species. The 1986-90 Atlas had found this species less common in western Massachusetts than in the east, and had very few reports from the Berkshires or the hill towns. However, Northern Broken-Dash has now been reported almost every year from the three long-running (1993-2013) Berkshire County counts, often in very good numbers (see above for Central Berkshire). It is also consistently found in good numbers on the Central Franklin and Northern Worcester counts. It does not seem markedly more numerous on the eastern counts such as Concord and Foxboro. However it is usually abundant on the Blackstone Valley NABA Count, with 2001, 2006 and 2012 being particularly good years there. On Martha’s Vineyard, it is reported every year (1999-2013) from the NABA Count, and is listed on the Martha’s Vineyard checklist as “Common” (Pelikan 2002). In contrast, there are still no records from Nantucket. On Cape Cod, it is well-reported from all the four NABA Counts, and from the lower Bristol County Count centered in New Bedford. Mello and Hansen (2004) term Northern Broken-Dash “common across the Cape in a variety of habitats.” In the Atlas years it was also reported from the Elizabeth Islands of Naushon, Nashawena and Cuttyhunk. It’s a bit surprising that it was not found in the 2001-2 surveys of the Boston Harbor Islands, since it does occur on Nahant and Plum Island in Essex County. Burlington Mary Cummings Park, 17 on 8/1/2008, B. Bowker; Harvard Fruitlands, 22 on 7/15/2010, S. Stichter; Leicester landfill and airport, 15 on 7/21/2013, D. Price et al. ; Mattapoisett Nasketucket Bay SR, 23 on 7/21/2013, J. Dwelly; New Bedford Plainville Rd., 16 on 7/23/2011, M. Mello; Newbury Martin Burns WMA, 24 on 7/2/2010, S. Stichter et al; Sandwich Mass. Mil. Res. 35 on 7/16/2011, E. Nielsen and P. Trimble; Sharon Moose Hill Farm, 15 on 7/25/2009, E. Nielsen; Sheffield Bartholomew's Cobble, 6 on 7/8/2012, B. Benner et al. ; Truro, 47 on 7/14/2013, T, Hansen et al. ; Wales Norcross WS, 10 on 7/14/2011, E. Barry et al. ; Wellfleet Wellfleet Bay WS, 17 on 7/10/2013, M. Faherty; Williamsburg Graves Farm, 50 on 7/18/2008 B. Benner et al; Williamstown Mountain Meadow, 15 on 7/14/2012, B. Zaremba and P. Weatherbee; Woburn Horn Pond Mtn, 11 on 6/27/2010, E. Nielsen et al. Northern Broken-Dash has also been found on Mt. Greylock , e.g. 3 on 7/11/2004, B. Benner, T. Gagnon and B. Callahan. Northern Broken-Dash apparently has one long brood here, stretching from about mid-June to mid-September. It becomes common the first week in July through first week in August, and peak numbers are seen in the second and third weeks in July ( http://www.naba.org/chapters/nabambc/flight-dates-chart.asp). Northern Broken-Dash is not an obligate univoltine species; it has two or more broods further south. In the 1990's and earlier, Burns (1985) found two broods in South Carolina, Georgia and the Gulf states, whereas Allen (1997) reported one brood in West Virginia, and Shapiro (1974) reported one brood at both the Finger Lakes and Staten Is. in New York. In 2005 Cech still reports only one brood "north of Philadelphia." But with demonstrated climate warming today, it is not impossible that there is a partial second brood occurring in Massachusetts. Careful observation and investigation is needed. Earliest sightings: In the 23 years of BOM-MBC records 1991-2013, the six earliest "first sightings" are 5/12/2012 Sheffield, M. Arey; 5/29/1998 Chelmsford, B. Cassie; 6/12/2005 Mt. Greylock, M. Lynch and S. Carroll; 6/16/2006 Chilmark, A. Keith; 6/17/2004 Canton Great Blue Hill T. Murray; and 6/19/1999 Wenham Wenham Canal, F. Goodwin. A century ago Scudder wrote “It usually makes its advent upon the wing early in July, between the 1st and the 5th, but it sometimes appears even as early as the 22nd of June; a week afterwards it becomes abundant, and it continues to fly throughout July” (1889:1700). Scudder is usually referring to the latitude of Boston, but in this case the geographical reference is to "southern New England." Still, the onset of flight today is clearly earlier than these dates, since in 15 of the 23 years between 1991 and 2013, the earliest BOM-MBC reports are in May or June, rather than July. In eight of the 23 years the first reports are earlier than Scudder’s extreme date of June 22. Latest sightings: In the same 23 years of records, the seven latest "last sightings" are 9/12/1995 Westport, B. Cassie; 9/9/2000 Georgetown, Crane WMA, F. Goodwin; 9/9/1997 Foxboro, B. Cassie; 9/9/1992 Foxboro, B. Cassie; 9/6/2003 Dartmouth Allens Pond, M. Champagne et. al; 9/4/2009 Northbridge Larkin Rec. Area, B. Bowker; and 9/3/2004 Windsor Moran WMA, B. Benner. The other 16 "last sightings" are in August. Scudder says the Northern Broken-Dash continues to fly "throughout July." Today's many September sightings represent either a lengthening of the end of the flight period or possibly a partial second brood. Conservation and proper management of open dry and wet meadows is necessary to provide habitat for this and many other skippers. Grassy areas that are mowed more than twice a year, such as most lawns, golf courses, and city parks, do not provide habitat (NatureServe 2010; MBC Mowing Guidelines http://www.naba.org/chapters/nabambc/butterfly-conservation.asp ). Northern Broken-Dash caterpillars will be feeding on grasses in late summer and early fall, and then overwintering at the soil surface. A single mowing in late fall, with the cutting blade set on high, should allow some middle-instar larvae to survive in a field, overwinter, and resume growth in the spring. Mowing during flight time (reducing nectar sources), egg-laying, and active larval feeding in spring, summer and early fall is counter-productive. Northern Broken-Dash probably will be able to adapt to climate warming in the northeast. NatureServe ranks it as S5 or secure in Massachusetts, Connecticut and Rhode Island; S4 or probably secure in New Hampshire and Maine.